Tomorrow morning, I’ll post the final books in my best reads in 2014. I originally planned to lump this one in with the larger post, but I had far too much to say about this book for it not to stand alone. View part 1, part 2, part 3, part 5, and my review of Gilead for the rest. Sometimes you pick up a book that hits you in the emotional gut and leaves you aching for days. A co-worker passed this book to me in the early days of my job in publishing (it was one of the first books published by a sister imprint). 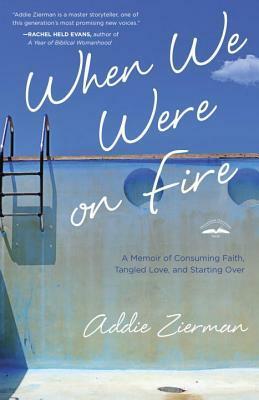 Addie Zierman grew up in the frenzy of 90s evangelical Christianity. She throws herself into this youth group culture with an intense, zealous desire to be the perfect evangelical Christian girl. As she grows older, goes to college, gets married, and attempts to find her identity, Zierman finds following her youth group directed theology and lifestyle to be spiritually insufficient. What follows is a struggle to find hope, joy, and genuine connections in a system that’s proven itself to be hollow. This memoir is Zierman’s emotional journey to discover herself and authentic faith. She feels swindled, bitter, lonely, and betrayed by something she bought into whole heartedly. Her journey is one of the most genuine stories of faith I’ve ever read, and I’m still processing its affects. Her story isn’t my story; we are two very different people who see the world in drastically different ways. But the pieces that overlap struck me intensely. It’s a book I’ve passed along to many people, begging them to hear her story and feel what others experience when their adolescent world doesn’t hold up to the problems of life. For evangelical friends and readers that pick up this book, read it with grace. This is a woman’s story of brokeness and disappointment. Don’t read it in a posture of defense, looking for ways to defend something you think she’s attacking. Read it like she’s a friend trying to tell you what she’s been through. Let it open you up to compassion for a difficult experience. Don’t dismiss her story as bitter because she rejects elements of your experience that you found fulfilling. I don’t agree with many of Addie’s conclusions or choices, nor do I think her experience means everything about 90s Christian culture was some sort of evil season that should be completely denounced. But there is an important conversation to be had about what parts of our church culture become attached to faith in ways that fail to sustain.